If you are interested in beginning the enrollment process with Advanced ATC, filling out the enrollment application is one of the first steps to getting started. Download and complete the form below, and submit it to Advanced ATC via email or fax. 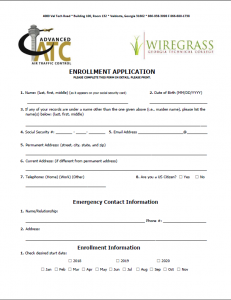 Once accepted, you will be enrolled with the Wiregrass Georgia Technical College Continuing Education Division.